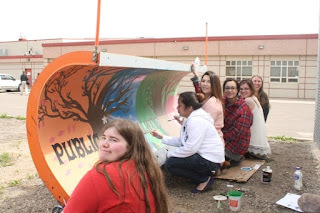 The Assumption Junior/Senior high school Art 30 class paints the blade of a city snowplow. From left to right: Natalie War, Divine Tanjay, Paige Collins, Anna-Claire Blackman, Elisha Johnson and their teacher Meghan Osfertag. Grade 12 Art students from Assumption Jr./Sr. High School have nearly completed painting one of the city's snow plow blades as part of the upcoming National Public Works Week. Beginning May 15, the week-long celebration will involve an open house of the water treatment plant, an open house of the public works building and a community clean up. Pollard added that the plow painting was a late addition to the week's agenda. “We put this together very quickly,” said Pollard. The art project was based on a similar idea from Public Works Magazine. The art class has been painting the blade for the past two weeks. She added that the students designed the project completely themselves. Anna-Claire Blackman, one of the students painting the blade, said that the her class decided together on a theme of the four seasons to represent the fact that public works is active all year long. The paint job is not expected to last the winter, but Infrastructure Services General Manager Azam Khan said that the city is planning to put a protective varnish on the blade to protect it from the elements. The finished blade will be placed on display at the public works open house on May 19 and will be put into service during the winter season. A second blade will be available for the public to decorate at the public works open house. “Sort of a graffiti wall,” joked Khan.